We did see evidence of this bullying square between Mars and Pluto in President Trump’s blatant attempt to push aside the will of Congress. 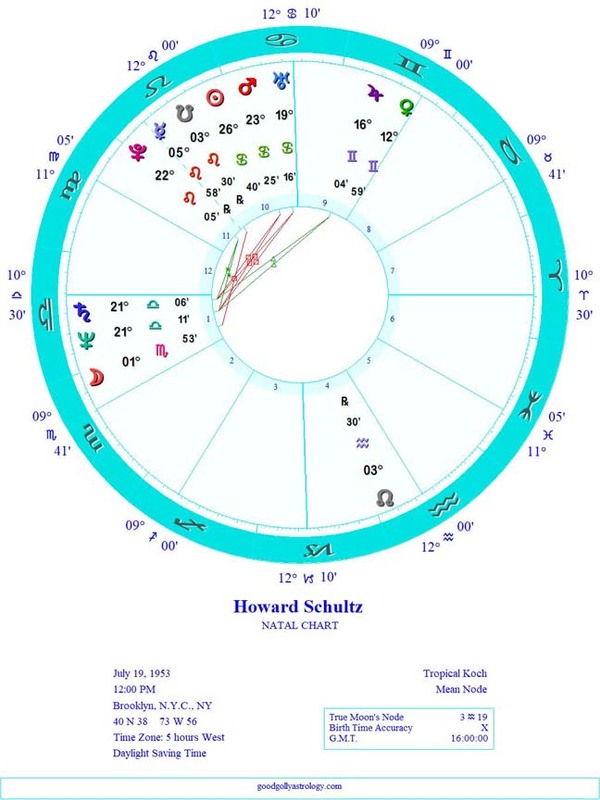 Mars is in the Tenth House of leadership in the Feb. 4 chart conjunct radical Uranus. The square to Pluto represents strong-arm tactics. It’s the stone-faced elephant in the room, or at least in the Oval Office: the Mueller investigation. When will it end? What will it reveal? WHEN WILL IT END? The President’s people play nonchalant, acting as if their guy is already in the clear. The President’s enemies are like children on Christmas Eve, with visions of indictable offenses dancing in their heads. 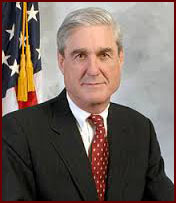 And we won’t know who’s got it right until Robert Mueller crosses that final T.
The recent ruling on the Paul Manafort case seems to be a step toward completion. It also seems that Mueller has established that Manafort gave data from the Trump campaign on prospective voters to a Russian citizen with contact to Putin’s government. 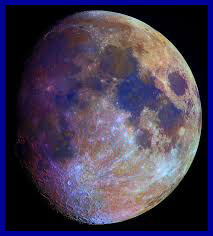 Right now Saturn is trine Mueller’s natal Mars which is an indicator of progress, but also of caution. The puzzle might still have a few pieces missing. So far I’ve focused on Democratic candidates for president in 2020, and from the looks of it I’m going to have several more of these to write about. However, the potential candidate who is causing the most stir right now is talking about running as an independent. 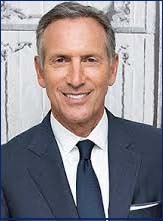 That’s Howard Schultz. I was thinking of taking a break from this series, then Amy Klobuchar announced her candidacy. She becomes the fourth woman and the sixth senator in what is already a crowded field, and it looks like it’s only going to get more crowded. So, back to work for me. 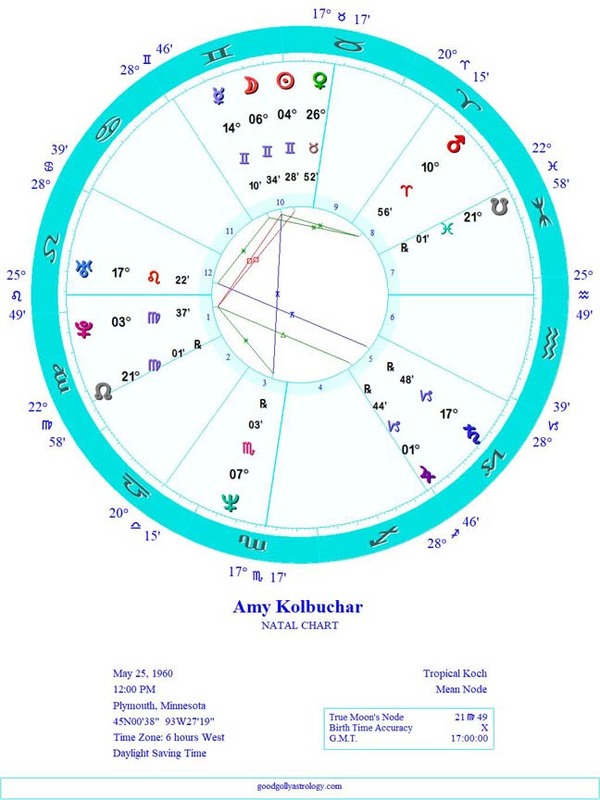 We don’t have a time of birth for Klobuchar (click on Amy Kolbuchar to see a chart done for noon on her date of birth) but this partial horoscope seems to repeat some trends we’ve seen in the charts of previous contenders. 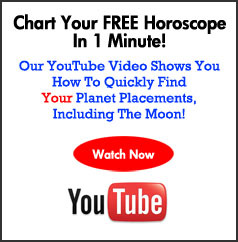 For example, like Julian Castro, she is a New Moon baby. 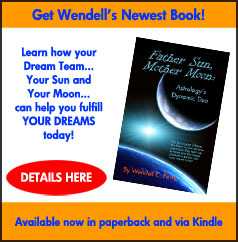 The New Moon was exact on the morning of her birth. 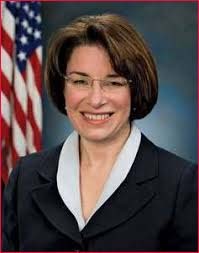 This makes Klobuchar a double Gemini. She’s clever and has good commununication skills. I expect that she will do well when it comes time for these candidates to debate. 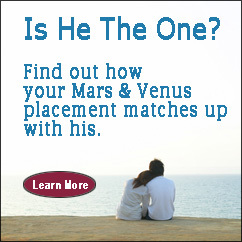 She also has Mercury in Gemini and it forms a helpful sextile aspect to Mars. She can be aggressive in her speech and impulsive in her thinking, but she uses these attributes to her advantage.